If you love games like Super Meat Boy, you'll be in for a treat with the impending arrival of League of Evil, which is headed to the Wii U and 3DS eShop at some point in the not-too-distant future. Publisher Ratalaika Games has teamed up the one-man Woblyware Studio from Finland to bring this awesome iOS/Android game to Nintendo platforms. For the uninitiated, League of Evil is an action game where you, as a bionic super agent, take on the mission to defeat the League of Evil. Using your acrobatic skills you'll punch your way through levels filled with deadly traps and defeat your enemies. The world is counting on you! In the console version of the game there will be exclusive levels and a level editor that will allow players to create and share their own stages. It will even be possible to share levels with friends on Wii U, 3DS and the PC versions of the game. Even with the limitation of touchscreen controls, League of Evil was a blast to play when it debuted on smart devices. 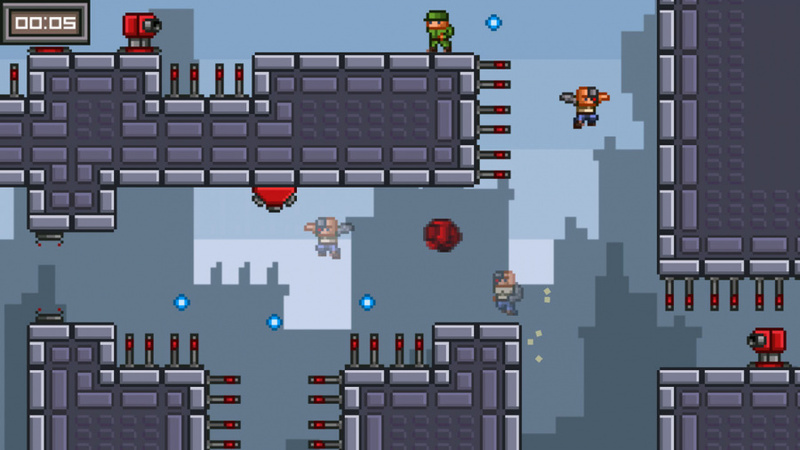 Is your body ready for the Wii U and 3DS incarnation of this 8-bit style action platformer? Had forgotten about this game, it was fun for a while. Would be curious to see the game running on a big screen with actual physical buttons. this looks fun! I'll probably get it on the 3DS when it's out! There's so many of these kind of games,they all look the same to me. For a moment I thought a Dr. Horrible game is on the way. looks cool, but very, very repetitive. I can see people buying it specially because of the level creator, but i dont think this is for me..
Not my kinda thing, but the level editor seems like it could be fun. Looks like a nice neat little game. looks fun. another solid eshop addition. It looked more and more like my cup of tea as the trailer went on. I definitely enjoy a rather challenging platformer to play on the side. I'll give it a try when it's out. By then I'm sure I'll have gotten over being worn out after finishing Super Meat Boy through and through. Might get, if so I would get it on 3DS, already got Mario Maker and would like to give the 3 DS some love, hopefully custom levels would be fun and easy to share. Controls don't look as tight as Super Meat Boy. In fact, it looks closer to the original Meat Boy flash game. I'm interested in knowing how level sharing works. Does it work like SMM or Stealth INC. or does it use QR codes or something? So the main hero looks like Nick Fury? Anyway, looks simple graphics and premise-wise. But fun.